While the name Hazy Boy might be a misnomer for the NEIPA-driven zeitgeist, there is no doubting the cloudy appearance of this American wheat beer. 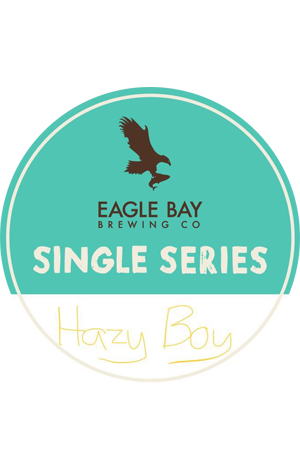 It’s the first Eagle Bay beer to be led by brewer Keegan Steinbacher, formerly of Mash Brewing. Although a fan of the NEIPA style, it wasn’t the direction he wanted to take, noting that “haze has been around forever in wheat beers” in an aside that may draw drinkers back to modern twists on classic styles. The American wheat style provides more leeway for pronounced hops and less reliance on the yeast to define the beer. In this way Lemondrop and Astra hops provide bright lemon, white wine, candied orange and light pan-tropical characters while Wheat and Maris Otter malts, with smaller additions of Rye, Carapils and Crystal malts, form the base of the cloudy beer. The firm bitterness and clean yeast profile makes this deceptively easily to drink for its near 8 percent ABV which caught many off guard at the recent South West Craft Beer Fest in Margaret River.